After gorging ourselves on sugary treats, unbuckling our belts and taking a long nap over the festive period we thought we'd better get back into the swing of things and kick off 2019 with another Community Spotlight. Back in December, Jon (who many of you may know as the face of our videos) was well on his way to becoming Pirate Legend. Being such a supportive lot, we decided to get the community involved in pushing him over the finish line in our Weekly Stream: Becoming Legend! Shelby by day, when she's not fighting injustice as Conservation Katie. [A]: I have been a gamer for just about my entire life. Really as long as I can remember. I grew up with an N64! Classics such as GoldenEye and Banjo-Kazooie were some of my first games ever… so thanks Rare! [Q]: So you were a Rare fan before Sea of Thieves? Do you have any favourite Rare games? [A]: Oh yeah! GoldenEye taught me everything I know about first-person shooter games. Star Fox Adventures is still one of my favorite games! I can still remember eight-year-old me opening my Christmas present and seeing Banjo-Kazooie in there! I spent hours Rat-a-Tat Rapping and Feathery Flapping all over the place. [A]: Currently my main games are Sea of Thieves and Assassin's Creed Odyssey. I play those two equally right now. Man, choosing a favorite game is hard. I love Skyrim. I have replayed that game a handful of times, each time discovering some new quest or character I managed to miss the first few times I played. I also love the Mass Effect series. Those games got me interested in RPGs. As I have gotten older, I realize how much I love being able to step into someone else's shoes for a while. Be the hero (or sometimes villain) of your own story! [A]: Pirates. For sure. A game where you get to be a pirate, sail a ship, dig for treasure. It was too much to pass up. Then once I got on and realized how much of a co-operative game it really is… that made it 10 times better. I have made more incredible friendships just over the last six months in SoT than I have in any other online gaming community. Shelby making friends with the locals! [Q]: How did you enjoy taking part in our Weekly Stream? [Q]: On our stream you mentioned you were almost a Pirate Legend, has that now changed? [A]: Yes it has! I am happy to announce that as of December 14th I officially joined the ranks of Pirate Legends everywhere! With the help of my awesome crew of course. 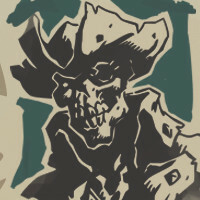 I sold my last piece of cargo, making me a Pirate Legend of Ashen Bone Dust! [A]: Oh, man. Well, being on the stream was definitely one. But there have been so many others. I helped out with one of the record-breaking hauls with the crew of 'Queen Allmondbeard's Revenge'. I got to play with the Loot 'n' Lore crew one night! But honestly it's just the times that I've been on a fully crewed Galleon with my internet friends. We run like a well-oiled machine. Everyone has a job, we communicate well and to top it all off, we have such a great time. I mean, that's what it's all about, right? Celebrating Pirate Legend status with PixelBeardQC and ElfGirl1! [A]: I am looking forward to expansion. It could be physically with more islands or regions, or maybe new stories that will be told like Merrick's or Captain Morrow's, or maybe it'll be additional ships we can sail! [A]: Wow, my greatest achievement in a game… Oh, I know! I have collected all 243 Riddler Trophies in Batman: Arkham Knight. I never want to see a tiny green question mark ever again. [A]: My name would have to be Lady Pirate Gunshot Willie! And I'd be vying for the title of Pirate Queen too! [A]: I enjoy spending time outside! I love to hammock, hike, etc. Hanging out with my friends and family for any occasion is seriously one of my main pastimes. I also collect decks of cards. I have over 100 decks of varying sizes, colors, shapes. Some come from far away, some are from movies, TV shows etc. I really like unique decks that are a little different to all the others. I have one deck where every single card back is a different color and when they're laid out it's this beautiful gradient. Chilling out, maxing, relaxing with a book. [A]: I am a zookeeper IRL! I work at the free-flighted bird and wildlife show at my local zoo. I am one of the keepers and trainers for all the animals in the show. I have been there for just about five years and absolutely love every minute of it! There you have it, our first Community Spotlight of 2019. We'd like to thank Shelby for telling us more about herself and wish her happy sailing on those Athena's Fortune voyages! You can be sure we'll be back again soon with a new Community Spotlight, so keep an eye on our website (where you can also catch up on any Spotlights you may have missed) and we'll see you next time. Know someone in the community deserving of Spotlight consideration? Get in touch on our social channels below!